Anyone who has used an older Honeywell keypad, especially touchscreen models like the 6270, has suffered through either mushy buttons leading to mistyped codes or lag while the touchscreen refreshes. This is almost completely eliminated with the Tuxedo Touch. The keypad wakes immediately upon touching it. Selecting an option (security, automation, etc.) brings the user to the next screen very quickly, without lag. It is a large improvement over past keypads, and results in much fewer mistakes during use. Older keypads were counterintuitive to untrained users, first forcing you to enter your code, then key which action you were looking for, such as Armed Away, Armed Stay, etc. Users who were not trained to use the keypad often did not realize this, and may simply key in their code and walk away, doing nothing, or not understand which key to push next. The Tuxedo Touch leads users through arming intuitively, first selecting Security, then arming mode, then asking for your code, then clearly telling you the system is armed, with actual voice, instead of just a beep. This is a complete departure from Honeywell's previous strategy, which required users to subscribe to their Total Connect service, an additional charge over monthly central station monitoring, if they wanted to remotely view status of their system. Eliminating potential RMR is bold in the security industry, and we suspect some dealers may oppose this move, though users are likely to embrace it. I can personally vouch that this web access is handy when you have that moment of "Did I arm the alarm system when I left?" In addition to the improvements to its basic use as a keypad, the Tuxedo Touch also offers some novel integration features. In the case of this office, it is integrated via Z-Wave to all the thermostats in the building, allowing the owner to check and see whether occupants have been turning the heat up or the A/C down, and make sure HVAC is set to more efficient levels when the building is unoccupied. Thermostats may also be set back when the building is armed. Lights and locks may be controlled via Z-Wave as well, if installed. 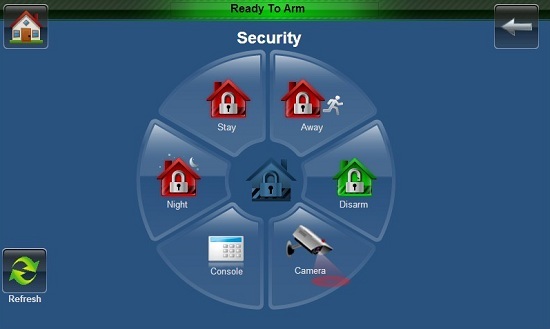 Finally, the Tuxedo Touch also may integrate with IP cameras, and most surprisingly, more than just Honeywell cameras are supported. Third-party cameras may be added via RTSP. These cameras are then viewable from the keypad as well as the web interface, so users may check if other occupants have left, lights are off, or the parking lot is clear before arming the system and leaving. Not having used competitive keypads, such as the DMP and 2GIG models we cited in our overview of the Tuxedo Touch, we cannot give a firm competitive recommendation. However, living with the Tuxedo Touch for the past few weeks, we can say that we have very few reservations about it. It is more expensive than some other keypads, nearly $400 online, and double what older keypads such as Honeywell's 6160 cost, but users may find they make up for this price increase in fewer false alarms due to untrained users or energy costs due to tampered thermostats and lights.